A recent study in Strength and Conditioning Journal tested a group of college football players and found that the players with a greater squat max, relative to their body weight, tended to have faster 40 times. Strength is speed. The strength of your prime movers plays an essential role in your performance, and without it, your ability to sprint, stop, cut, break, jump, and hit will be limited. As a Great Cornerback, it is very important to know how your body moves, so you can strengthen those movements and become that much greater an athlete. Your quadriceps help your glutes to give you a push when you start, but then only act as shock absorbers and stabilizers for your knees. Meanwhile your calves and hip flexors are the muscles that get your legs off the ground. You should safely, progressively get these muscles as strong as you possibly can, and strengthen them through the same line of motion that you will move in while sprinting. Later, you'll convert this strength into power. 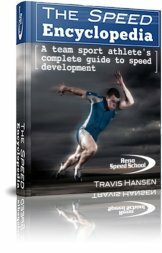 This translates to more force generated during the contact (or ground support) phase of sprinting, which enables your legs to pull your body further through each stride than they would if they were weaker. And "viola", you then have a longer stride. to help with your arm swing. Having core strength is crucial because your core supports ALL your athletic movements. During sprinting, for example, your core acts as a stabilizer while your limbs propel you forward. So if your core is weak, any movement of your arms and legs will be limited by it. This means you will be slower. It is the things you don't do that come back to bite you, so make sure you don't overlook the importance of a strong core.